This qualification benefits all learners by giving them greater confidence in using the internet safely and it is especially suitable for delivery in schools at key stage 3 and 4.
e-safety examines the potential risks associated with being online, how to protect yourself and your personal information online, as well as how to behave responsibly and within the law whilst using the internet. The course is designed to be delivered in the classroom and provides 20 hours of guided learning mapped to the curriculum. 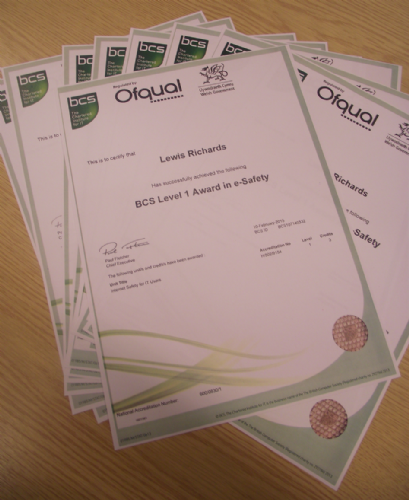 The BCS e-safety qualification maps to parts of the National Curriculum for PSHE - Personal Wellbeing and Citizenship. We are very proud that all the KS3 pupils who have thus far taken the examination have passed.